Super Friends: The Legendary Super Powers Show is an American animated television series about a team of superheroes which ran from 1984 to 1985 on ABC. It was produced by Hanna-Barbera Productions and is based on the Justice League and associated comic book characters published by DC Comics. Super Friends: The Legendary Super Powers Show was the first Super Friends series in a new format since 1979's The World's Greatest Super Friends. Continuing the previous three years' policy of producing short stories, this series' format was two stories per half-hour, so all the separate stories were ten minutes long each. Furthermore, the Wonder Twins were largely supplanted as audience identification figures by Firestorm, a well established teenage superhero in the DC Comics Universe. However, continuing the trend from the "lost season" episodes, the Wonder Twins were paired with other Justice League members, as opposed to always teaming up with Wonder Woman or Batman & Robin. In "Case of The Shrinking Super Friends" they are teamed with Firestorm and Robin. In "Uncle Mxyzptlk" they work with Firestorm and Samurai. In "Village of The Lost Souls" they work with Wonder Woman and Apache Chief. Unlike previous series, Super Friends: The Legendary Super Powers Show was produced to tie-in with the Super Powers Collection toyline produced by Kenner, hence the name change. The general story, as detailed in the mini-comics that accompanied the figures, was that the major heroes of Earth had teamed up to fight Darkseid and his villains. According to DC writer/historian Mark Waid, Aquaman's sole appearance in The Legendary Super Powers Show comes via his appearance within the opening credits. The same is true for The Flash. This was the first time Wonder Woman was animated with the W symbol on her costume instead of the eagle design; this carried over into the final series, Galactic Guardians. Lynda Carter was unable to reprise this role for animation because she was busy with her singing career, commercials for Maybelline cosmetics, and television films. The series was also noteworthy for using Adam West as the voice of Batman, two decades after the end of his live action television series of Batman. West replaced Olan Soule and would continue through the subsequent Galactic Guardians series. Darkseid – Outside of the comic books for the first time, Darkseid was still attempting to conquer Earth (often with help from other villains), but also had a secondary goal, of making Wonder Woman his bride. Darkseid brought a degree of seriousness to a show that had largely lacked it. Kalibak – His appearance was not as brutish as in later TV incarnations, more like the original Jack Kirby design for the character. He was almost always depicted as boastful, dull-witted and ineffectual against the heroes. Brainiac – The mechanical version of Brainiac appeared in the episodes "The Wrath of Brainiac" and "The Village of Lost Souls". In "The Wrath of Brainiac," Brainiac reveals that he shed his earlier appearance when he worked alongside Darkseid. Mirror Master – Mirror Master appeared in an episode entitled "Reflections in Crime". The Flash does not appear in this episode. In the episode, Mirror Master sets about trapping the Super Friends in this particular episode inside mirrors called the sixth dimension. The Super Friends managed to escape and trap Mirror Master in a House of Mirrors. Lex Luthor – He appeared in the opening and the episodes "No Honor Among Super Thieves" (in which acquires his power suit from the comics of then), "Case of the Shrinking Super Friends" and "The Mask of Mystery". Mister Mxyzptlk – In this series, Mxyzptlk's name is pronounced as Miks-ill-plik (backwards, Kilp-ill-skim) and he takes to tormenting all the members of the team, even when Superman is absent. For this series, Lex Luthor and Brainiac were completely revamped to resemble their comic book counterparts. Note: Beginning with this version, Adam West replaced Olan Soule as the voice of Batman. 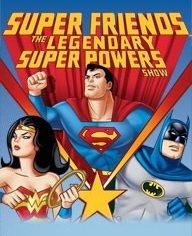 On August 7, 2007, Warner Home Video (via DC Entertainment, Hanna-Barbera Productions and Warner Bros. Family Entertainment) released The Complete Series of Super Friends: The Legendary Super Powers Show on DVD, featuring all 16 episodes of the eighth Hanna-Barbera-produced Superfriends series on a 2-Disc DVD boxed set, uncut and unedited, presented in its original broadcast presentation and original airdate order. ^ Cyrenne, Randall (2007-09-30). "Super Friends: The Legendary Super Powers Show: The Complete Series • Animated Views". Animated-views.com. Retrieved 2016-06-01.